1. When Can I Bring Items In? We do buying and consigning on Mondays from 10am-6pm only. *No buying or consigning in the month of December. 2. What Do We Take? 3. What Don’t We Take? 4. Any clothing items must come in clean and on hangers. We will gladly return the hangers to you, but having them on hangers speeds up the buying process. We will not accept clothing brought in bags or boxes. 5. We accept all off-season items except coats. We only accept coats during the month of September. 6. For large pieces of art or furniture, our suggestion would be to take a picture of it and email it to us at streetscene2575@aol.com, so that you don’t have to haul it in only for it not work in the store. Every Monday* from 10am-6pm, we both buy and consign items in the store (no buying or consigning in December). There’s no appointment necessary, so you are welcome to stop in the store whenever is most convenient for you. 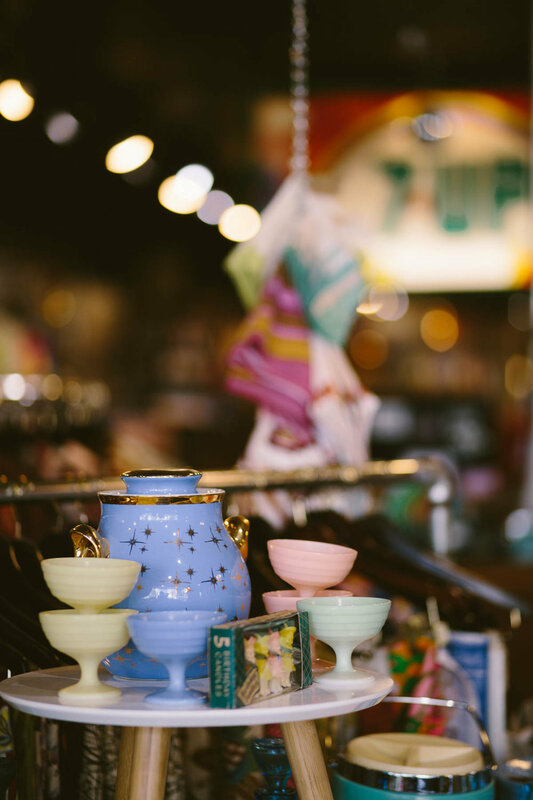 We accept items from the 1950s, 60s and 70s. We have a table set up for buying and you just bring your items to the table. 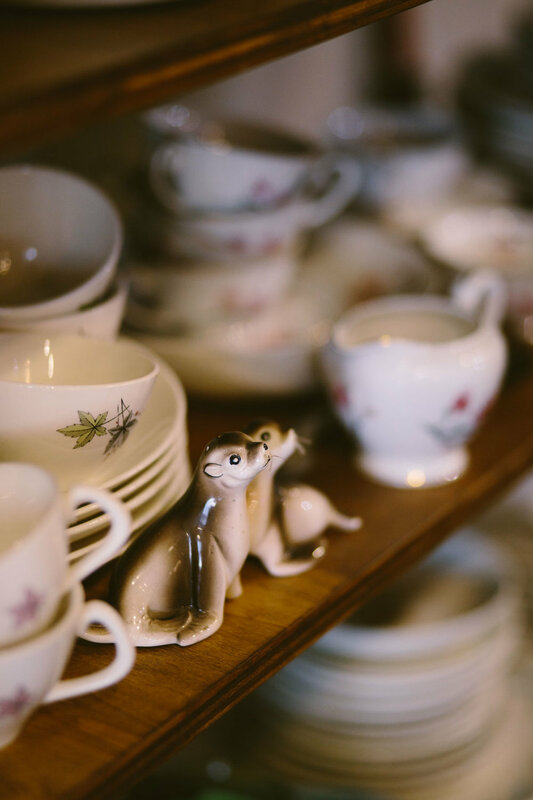 Sometimes there will be someone in front of you, in which case you leave your items next in line and shop around the store or get a coffee at our neighbor, Coffee Times Coffee House. Under no circumstances can you leave your items and return later (even if it’s later the same day), you must stay in the store until the transaction has completed. We consign items that would retail for $50 or more (i.e. furniture, nice cocktail dresses, large dish sets, etc). It’s a 90-day consignment and you set the original price of the item. After 30 days if the item doesn’t sell, we mark it down 10%, after 60 days if the item doesn’t sell, we mark it down a total of 25%. If the item doesn’t sell after 90 days, we give you a call and you have a 3 day grace period to pick up the item. If you don’t pick up the item after 3 days, it becomes property of Street Scene and may be subject to donation. With any and all items that come into the store, we treat them with the utmost respect but accidents happen. Should your consignment item be harmed in any way, Street Scene does not take responsibility for it and we will promptly call and let you know what’s happened. It’s rare, but it does happen, so keep that in mind when bringing items in to consign. If the item sells, you receive 60% of the profit and we take 40%. You will receive a call that you have a check to be picked up the 15th of the following month of its selling date. For example, if an item sells May 7th, you will have a check ready on the 15th of June. If you have any items that would sell for less than $50, we buy them outright and give you cash on-the-spot. If the total of your items is over $100, we will pay you in check rather than cash. We will come to you! We are happy to make a trip to you if you have come into an estate or a large quantity of items. When you're dealing with an overwhelming load it can be difficult to decide what to bring to the store. Letting us come to you is more beneficial for all parties involved. Every situation is different, so please email us at streetscene2575@aol.com for more details.